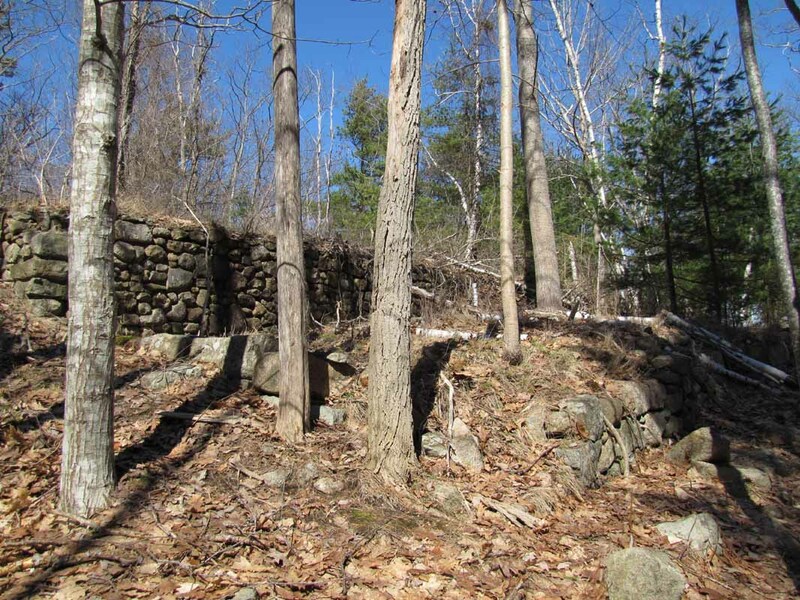 Barberry Ledge, located on the west side of Cleftstone Road, burned in the fire of 1947. Following is an account of events related to that cottage by owner Christine B. Rowell, with spelling, punctuation, and paragraph breaks following her account, with the occasional typographical error corrected. Remains of a foundation wall can be seen at the bottom of this page. I went up early to Barberry Ledge the last week of May and spent the first three weeks alone enjoying my dear place. After that I had a succession of four lovely guests with many a gay time, the last one being Mrs. John Gilpin who left me the 5th of October wishing to be taken over to the Bridge by six o'clock in the morning to meet a car there to go to her home. We set the alarm clocks at five o'clock and stepped out on the terrace together at 5:33 as the first rays of the red sun struck through the pines and the brilliant flame-colored autumn leaves. We rode to the Bridge with the fields covered with white frost and as Mrs. Gilpin had never seen the color before, it was a beautiful and exciting drive. She left me at six o'clock, and what was I to do at that glorious time in the morning? I made for the mountain road and at a few minutes past six found myself on the top of Cadillac Mountain with the whole world before me, shared by three leaping deer taking their early morning exercise. After this glorious morning, hot summer weather came to us and day after day it was breathless and I didn't enjoy the beauty of the coloring as much as usual for it needed the cold, bracing air of the autumn, and I thought how thankful I am that we don't have these flame-colored leaves all the time, for three hot weeks passed without rain. Then one day we heard the three ominous blows on the fire whistle, which meant for all men to help with a forest fire. I learned it was back of Mr. Shea's farm, near the Emery District. Later I met Mr. Shea in the village and asked him if he was anxious about his farm. He replied, "Oh no, it is not timber, only blueberry fields that we burn over anyway, but we would not have done it quite so early." I said, "Then I don't have to worry about you, Mr. Shea." After picking up Miss Clarke-Smith, we started toward Town Hill and made an entire circuit of the fire, stopping to speak to men who guarded each road, at one place seeing the flames themselves devour the side of a hill with great rapidity. All the men were quite frank, and said: "We cannot stop this fire. We are trying to guide it to Eagle Lake. We will have water there and may be able to arrest it. If not, it will go to the ocean." As my house was on the south side of Great Hill, it would mean that I would be the first to have a forest fire reach me, if it continued in that direction. After taking Miss Clarke-Smith back over the mountain road (as the Eagle Lake Road was entirely closed), I returned by myself the same way. Never will I forget the view as I reached the high point on the mountain road that looks toward the sunset at Blue Hill. A red sun was disappearing over the horizon, sending up long brilliant red streamers over a heavy purple cloud. Just over my head was an enormous mass of purple, pink, orange, black and grey smoke, brilliant in the light of the setting sun - a whirling mass, funnel-shaped, driven by a strong northwest wind - and beyond this whirling mass, a glimpse of the peaceful background of the mainland, with the bay and the mountains like an Italian primitive painting. - the strong wind blowing this great circular mass in a southwesterly direction with great speed. McFarland's Hill and Great Hill were between my house and the fire, which meant about five or six miles. On reaching home I left my car at the front door where it stayed day and night for the next three days. I started to read, but after a few minutes all lights went out everywhere in the town, and the idea of sitting alone all evening in the dark was not pleasant. I had promised that evening to play bridge with the Bar Harbor village ladies, and called up about six o'clock as to what they were going to do? Nothing daunted, they said they had some lamps and if I had candles: They'd let me know later. Would I come? I couldn't be outdone by those brave and cheerful ladies, and said yes, if they got me on the telephone again. But if the telephone was cut off and I didn't hear from them, I wouldn't come. At seven o'clock there was a ring and Mrs. Shire said: "We're going to do it." So I changed my dress, jumped into my car and drove to the village in complete darkness. There were four tables of us and not very good bridge, but Mrs. Shire and I came up third. I was glad to get out in the night air, for the last part of the time I began to be a bit restless. I took two ladies home and drove up Eagle Lake Road to where I turned right for Cleftstone, which was guarded by several men. I stopped and said, "Where's the fire?" They said: "Half a mile along Eagle Lake Road." I said, "My house is the only one occupied around here and we are three women alone. Would anyone give us warning if the fire came any nearer?" The young man said, "I go off duty here very soon. I don't know if anyone takes my place or not." So I went home, had the car ready at the door, went to my room, lit two candles, packed my important desk things, folded my dresses in one bag, my shoes in another, made a package of precious photographs and carried one thing after another down to my car. I opened the door into the back hall but no one stirred. Finally I lit a tiny fire in my sitting room and said goodbye to my adored things. Again the ominous sound of the three blows from the firehouse, and I knew that Bar Harbor was threatened. I got in my car and drove to the corner of Eagle Lake again (three o'clock at night). No one was there. I waited until a jeep, filled with young men coming from the fire, came along and I blew my horn. They swung around to speak to me. I again said: "My house is there in the wood and shall I wake the other women and be ready to leave? Will anyone give us warning?" One of the youn men replied, cheerfully, that the equipment would come down first and I would hear that - and he didn't think the fire would reach me until about noon the next day. I returned home. The smoke by this time was becoming like a wall built from tree to tree around the house. I drove the car down the driveway to the gardener's cottage and went up to the second floor where I found little Mr. and Mrs. Nolan frightened to death and not knowing what to do. I said, "Pack at once!" And poor little Ethel packed while Nolan and I carried the things down to the car. I shall never forget the sad but amusing episode of Ethel's trying to tie three round hat-boxes, one on top of the other, each containing a ten-year-old hat - tying a string around them with her trembling fingers with great care, and the minute I picked them up, of course each of the three band-boxes took a vigorous bounce to various corners of the room. When my car was fairly full I told her to keep on packing and I would return for more. The great question of what to do was still in my mind - where would the things be safe? An inspiration came to me to take them to Mrs. Max Farrand's garden house by the side of the ocean. I drove rapidly across the quiet town in the early light to find everything closed at Mrs. Farrand's, but on running to the gardener's cottage I saw through the window that he was about to have an early breakfast. I said I was a great friend of Mrs. Farrand's and would he let me put some things in the garden house? He opened the door at once and we pushed in the ridiculous band-boxes and piles of clothing. I then hurried back to Barberry Ledge. The sun was just up, a fiery red ball through the heavy smoke. Poor little Mrs. Pritchard was up and dressed in the kitchen and feeling that the last judgment had arrived. Two young men had been to the house on motorcycles while I was away and had left word to evacuate the house at once. I said, "Put your clothing in your sheet, tie them up, make some coffee, and we'll leave at once," giving the same order to Elizabeth Davis. I took a cup of black coffee, saw that the packages were in the car, and I think it was seven o'clock when I looked out. A miracle had happened. We were saved! The wind had shifted, the air was sweet, the sky was blue, a bird sang to us, and a great beautiful white cloud had blown to the west. It was an unforgettable moment. We did not have to leave. An hour later Miss Harriet Ogden, hearing that I had been ordered evacuated, came up to offer help. I gave her a couple of boxes to save if my house went and a couple of boxes of odds and ends of Christmas presents for my grandchildren that were ready to express to New York. In the last week of that beautiful weather, my house was being painted for the first time in ten years and I had enjoyed having Mr. Sprague and the two other nice painters around the house. All three men suddenly arrived, looked at me so kindly, saying: "We can't do any work today. Is there anything we can do to yelp you?" I knew that I must save my car to hold the four human beings for whom I was responsible, and if I began to pick and choose my treasures I might not be able to keep a firm hold on myself. I had already packed one box of my precious amber glass that I had carried in my own arms from London long ago, I always left it every summer in a special box, in a special place, and I said: "I can live without this glass, but I do love it, and perhaps you will take it for me to Mrs. Farrand's garden house." I gave them one other box of small treasures and shall always be grateful for their help. I then took more things from Nolans' over to the garden house, for every man available was fighting fires, or saving their own places, and there was no one I could call upon. Nolan helped put in the things, but when I reached the garden house I pulled them out by myself, even the heavy sewing machine. The morning passed quietly. The heavy wind of Tuesday had died down and the village was like an encampment with 2,000 men from Dow Field at Bangor, fifty miles away. The parking place was filled with the grey army vehicles of every description. No one in the village was doing any work but there was never the slightest sign of any panic. I drove home and met Mr. Miller. He had cut down a very large tree for me the day before and had come to save his equipment. Ethel Nolan was bemoaning a trunk. That was too much for me. I asked Mr. Miller if he would take it, which he said he would in his truck. I went to the village to send more express packages off and to keep my car full of gas, which, unfortunately, I couldn't get as the lights were out and the pumps weren't working. On returning home I found my dear Mr. Miller had not only taken Ethel's trunk but had come to the house and taken mine which had a few things in it, also Elizabeth's, who hastily emptied her bureau drawers in her[s] before letting it go. That afternoon the word was still good. No wind had sprung up so I piled as many of my things in the car as I could, took Elizabeth and Mrs. Pritchard and her things, still tied in a sheet, and we went to the garden house and packed our respective trunks, mine being about three-quarters full. I then ordered the express man to call for it and I took the girls up the side of the mountain where I was allowed to go until stopped on the mountain road. I asked the guard how things were going and he said: "It's holding its own." I said: "Did you say it, or you, are holding your own?" And he said, with a good deal of emphasis: "I said it was." And we got one magnificent view of McFarland's Hill covered with smoke and flames. We had a quiet supper and having been up all the night before and there being no wind, I went to bed and slept. The early morning radio said the fire was no worse. There had been a beautiful quiet moonlight night. About 8:00 A.M. a very strong west wind started blowing the whole fire to Hull's Cove. I went to the village to inquire and found that they were ready to evacuate Hull's Cove and men with trucks were standing by. But they did not expect to do it until about two o'clock. I returned and had lunch. At two o'clock Mr. Lymburner, the electrician, came up, looked at me most kindly and said: "Is there anything that I can do for you? I can give you more water power if you have hose." As we pump all our water I knew it was useless. I said: "What is the latest news?" He said, "I have just heard that a strong northwest wind will come late this afternoon." I said, "Then, Mr. Lymburner, my house will be the first to go," and he agreed. I said, "If you will take some of Mrs. Nolan's things over to the garden house I will be very grateful." I then packed a little new linen from the garret. Elizabeth said: "Would you like me to pack the china tea set?" And I said, "Yes, I really would." She packed it and we got it in the car, and I told them both to be ready and I would go down and get gas which I had not been able to get the day before. I got gas, oil, water and air for tires. I went to the express office to see if my packages were going and my trunks. Mr. Graves said "Yes, the man is collecting now and we expect to send everything by Eagle Lake Road which has been opened again after the fire swept across it." I said, "Then I will give you another," and crossed Cottage Street to get the package out of the car. As I reached for it I heard a roar, and down Cottage Street came dancing dry autumn leaves from every direction, then dust and dirt and then heavy smoke. Over Great Hill at the end of the street a steady fiery red light appeared. I pushed the package back, slammed the door, jumped in and drove back to Barberry Ledge as fast as I could. I was always afraid of motor accidents as jeeps with young men were rushing everywhere and, naturally, all of us were a bit shaky. I reached home, told the two girls to be ready, drove back down the driveway to the little cottage in time for the second call for Mrs. Nolan. As the smoke was very thick again, the poor little creature was vaguely running from one precious thing to another and throwing all the old dresses she possessed over her arm. Finally I grabbed the dresses and said in a stern tone: "I am going, you can follow me." I reached the front of the cottage on the driveway and saw both side[s] of the driveway blazing with fire. My car was facing the other direction. I dropped the clothes, jumped in the car, went to the main road to be able to turn and drove up through the flames, making the turn around, back to the front door with flames to the right of me, opposite the front door. Mrs. Pritchard was ready with her bags but crying in a pathetic tone that Elizabeth wouldn't come. I shouted, "Get in the car," and took one flying leap up the stairs to Elizabeth's room, saying "Come, leave everything!" She had been dressing but by that time had put on her hat. She grabbed her bag and we both got in the car. By that time she saw the flames around us. I told Nolan to get in but the poor man shut the door and said, "I will walk down," and he took his beloved little path through the woods from my house to his that he had travelled a dozen time a day through 32 years. I tried to grab him and force him in but he was beyond my reach, and I had to go down between the fire again. Poor little Mrs. Nolan had come out, grabbed her precious dresses again and was whimpering in the middle of the street. I stopped and she thrust all the poor old dresses in the car and I finally hauled her in the front seat. Then there was an awful moment! Where was Nolan? Did I have to go in the flaming woods to find him? If this were a novel Nolan should have stumbled on the way down and died surrounded by flames on his lovely path. He loved me and prayed for me every night, but I think he loved the house best. At that moment the poor frightened man appeared and climbed into the car, just able to stand and get inside - and I left my perfect house, after 32 years of comfort and happiness, little Brunhilde, surrounded by fire. It was impossible to turn to the right, which was the shortest way out, as flames were on both sides of the main road, so I turned left, seeing one more patch of flames starting up my bank. Passing the McCormick house I stopped to shout, "Leave at once, my house is on fire." At the corner of Eden Street the magnificent fire-fighters from Dow Field were pulling out the big hose, attaching it to the hydrant, but the whole of Cleftstone Hill must have been already well on its way to destruction, - Damrosch, Patterson, Morganthau, Rinehart, Ayer, Darlington - all going but Miss Mildred McCormick. I then drove through the deserted village, everyone trying to save a few things, blowing my horn to warn people, and up the main road. At the athletic field two guards were already there waving me on. I turned in to Mrs. Browning's driveway around the back of her gardener's cottage where the poor Nolans got out with the great bundle of the famous clothes, and they cried goodbye to me. And I left them in charge of Mrs. Coswell, as I had arranged for them the day before in case of an emergency. Mrs. Coswell is a friend of Ethel Nolan's and a splendid person. I then turned out on the main highway and started through the gorge, I looked at my watch. It was just 4:10 P.M., Thursday afternoon, October 23rd. The fiery red light was all along the top of Dorr Mountain and Cadillac, outlining their beautiful slopes. As I reached Otter Creek the poor inhabitants were all coming down the road to be picked up - women, babies and children. The line of cars was not too heavy yet, but one had to drive carefully. When I reached the County Road and the hill overlooking Seal Harbor, a beautiful quiet red sunset was along the west, and our first breath of clear air revived us, and I saw the very last flicker of the red sun go down as I had seen the first glimmer on that beautiful morning from my terrace three weeks before. My one anxiety now was to reach the bridge before the fire caught me. I went by Asticou, turned right by Hadlock Pond toward Somersville [sic], then to the right through Town Hill with a great volume of smoke and fire on my right, but by now I knew I could make the bridge at last. Two men were guarding the bridge and I shouted goodbye to them. After I crossed I took the country road to the left so that I could go slowly without traffic through to Ellsworth. Looking back on the Island was a sight never to be forgotten. The whole impression of the Island was more like a great volcano pouring fire down upon us and heaving great volumes of smoke and flame up to the heavens. We drove in the dark to Bangor and there we stopped at a little restaurant and I took my car to a nearby garage as I couldn't manage a parking meter! We all three got a little supper. A staff officer of the "Bangor News", who had just returned from Hull's Cove, asked for my story and it was printed the next day. After a bite I drove to the house of the Misses Wing. I knew they were in New York but I also knew their man would take care of us. After finding it in the pitch blackness, we discovered no one was home. Then I drove back to the garage. No one could have been nicer than Mr. Jordan the man in charge. I left my car and the few possessions that I had saved in his care. I went around the corner to the hotel and asked for a room. There weren't any. Could we sit in the parlor, as we were leaving at seven the next morning? They said, "Certainly," and when we returned with our bags they had kindly found two rooms for us. At 10:30 I called up the Bangor News, to be told that shortly after I had escaped all roads from the Island had been closed by fire and that 4,000 people were waiting at the wharf to be evacuated by boat. After that there was certainly no sleep. And I was sitting up knitting on a little scrap of wool that was in my bag, when the telephone rang at twelve o'clock, and my boy from Coconut Grove, Florida, had found me. He had known nothing about the fire as he hadn't turned on the radio, but John Archbold had most kindly telephoned him from New York that he had just heard their house (next to mine) had gone, and so where was I? Donald called up my sister in New York. I had telephoned her at ten o'clock that I had reached Bangor safely and that I would be home by train the next day. Donald called up several Bangor hotels and finally found me. I had been thinking of him all day, as it was three years to the day that the U.S.S. Princeton had gone down off Leyte and he had had that great adventure - and now I had had mine.